GRAFENWOEHR, Germany — Time to arrange a yard sale, dig up some sturdy cardboard boxes and begin organizing important paperwork. You’re making a military move across the Atlantic. Congratulations on receiving orders to Germany! Living in Europe is exciting. And here at U.S. Army Garrison Bavaria, we have tons of travel opportunities and a bustling community to help get you started. Regardless of your experience, and whether or not this is your first permanent change of station, or PCS, moving — especially overseas — can be a very daunting and exhausting process. It’s important to be as prepared and knowledgeable as possible, every step along the way. We built a comprehensive PCS guide to help make the transition a simple and successful one. The guide is meant to be a general overview of the process and to help make sure you leave no stone unturned. These tips come directly from spouses who’ve already made the journey. If you have questions during the move, reach out to your military sponsor or your nearest U.S. Army base’s Army Community Service. ACS staff is always available to help Soldiers and families stay ready, resilient and informed. Check out the Newcomers Guide. The Newcomers Guide is a one-stop, comprehensive resource for incoming Soldiers and families. 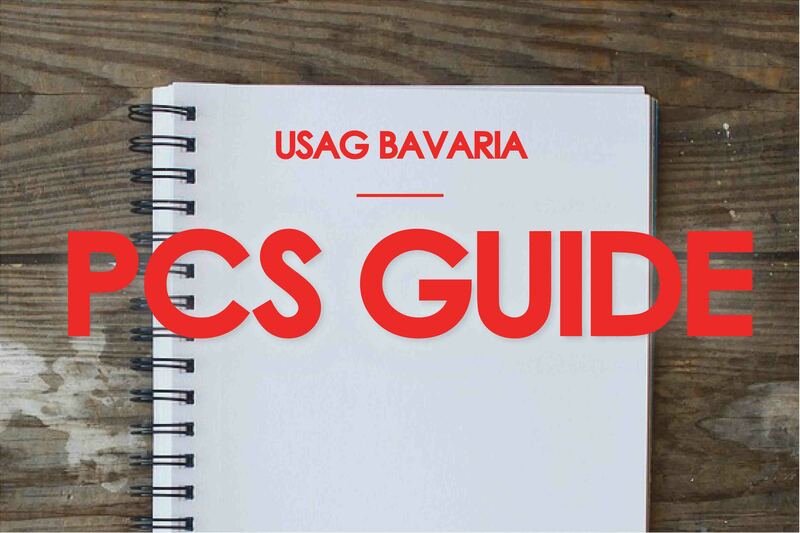 The guide can help make a move to USAG Bavaria smooth and efficient. Request a sponsor. A sponsor is someone — ideally from your or your sponsor’s unit — who will help arrange a time and place to pick you up and show you around. To request a sponsor, go to Sponsor Request in Army Career Tracker. Request passports. Dependents traveling to USAG Bavaria will need an official passport with a Status of Forces Agreement, or SOFA, stamp. Soldiers and family members will also need tourist passports to do any traveling outside Germany. Plan the move. Department of Defense It’s Your Move and Shipping Your POV are great documents to understand your rights and responsibilities during the shipment process for household goods and privately-owned vehicles. Go to Military One Source’s Plan My Move to develop an initial moving to-do list. Arrange the move. Now it’s time to make the move official. Set up an account with the Defense Personal Property System, or DPS, and schedule a move date at move.mil. To schedule a date to ship your privately-owned vehicle, go to www.pcsmypov.com. If you have any problems along the way, call your local military installation’s transportation office. Make preparations to PCS with your pet. Check out the Shipping Pets page for guidance and country-specific requirements regarding pet shipment. You can also connect with the Veterinary Treatment Facility here on Facebook. For more tips on shipping pets, join the community-driven Facebook page Pet Community of Bavaria. Prepare your kids. The Department of Defense Education Activity, commonly known as DoDEA, has a handbook and checklist for moving families. Before you leave your current duty station, renew your children’s sports physicals and schedule any required immunizations and dental examinations necessary for school and Child and Youth Services. Since most examinations are good for a year, this allows you to settle into your new duty station without the added stress of medical appointments and prepares your kids for school and childcare upon arrival. Beginning June 24, parents can also request childcare online at MiltiaryChildCare.com. Request housing. USAG Bavaria Housing has a variety of on- and off-post housing. Follow them on Facebook for housing pictures and updates. Newcomers can also request housing advance. Reserve hotel accommodations in advance. Make reservations for temporary lodging prior to your arrival. Some hotels accept reservations 180 days or more in advance. Go to USAG Bavaria Lodging for a list of on- and off-post hotels at the garrison’s four communities. Take the U.S. Army Europe driver’s orientation and license test online. First, study the USAREUR driver handbook. You’ll need to know this information to pass the test. Follow these instructions to enroll in an orientation and to take the test. Explore employment and volunteer opportunities. Don’t wait until you get here to apply for jobs or set up a home-based business. We post a weekly job listing and other resources on our Employment You can also search and apply for volunteer positions in the Volunteer Information Management System in five simple steps. Organizations like the American Red Cross, USO and health clinics, as well as other garrison functions, are always eager to have more hands on deck. Get to know the USAG Bavaria website. Bookmark it: Bavaria.Army.mil. This site has community news, events, phone numbers and the full gamut of garrison services all bundled into one mobile-compatible, responsive site. It will come in handy. You can also follow us on Facebook for regular updates at www.facebook.com/USAGBavaria. Take the bus. In most situations, Soldiers and families use Patriot Express when traveling to Germany on orders. These planes arrive at the main military airport in Ramstein, Germany, where Soldiers undergo basic check-in procedures. Soldiers and any accompanying family members are then bussed to their assigned community at USAG Bavaria. The trip can take several hours, depending on traffic, weather and the flight arrival time. Attend the initial in-processing brief at the reception center. The bus takes all Soldiers and families directly to the community reception center. Soldiers receive a short initial brief about in-processing procedures, while families wait in the reception area. Stretch out your legs, charge your phone, walk your dog, have some snacks and meet some of USAG Bavaria’s warmest staff. Sponsors take all families and Soldiers to their hotels or lodging accommodations. Start day one of in-processing. The onboarding process for incoming Soldiers and families typically begins the day after you arrive or the next business day. In the morning, Soldiers should report to the Military Personnel Division — usually located at your community’s reception center — for all-day in-processing. Follow the checklist. MPD staff prepare a step-by-step checklist — loaded with community resources — based on the Soldier’s arrival date and schedule all appointments in advance. The checklist covers the full spectrum of onboarding services, from prepping a postal box and updating ID cards to registering for housing and overseas TRICARE. The list is extensive, but it is designed to help you start your time off on the right foot. Spouses can also use the Spouse Checklist as an additional in-processing guide. Enroll your kids in school. In order to register your child for school, you must have current orders (family travel orders and sponsor’s orders), the student’s birth certificate, student’s social security card, sponsor or spouse ID card, current shot records, two local emergency contact information (other than parent) and one states side permanent contact. Your child cannot start school without the documents listed. Step 1: Get a USAREUR Driver’s License. Soldiers and family members can either take the USAREUR driver’s orientation and test online or attend a class in-person. To attend a class, contact your community’s Drivers Testing Station for the schedule. Once you’ve completed and passed the test, bring the certifications and a state-side license to the Drivers Testing Station. The stations allow walk-ins and scheduled appointments. Step 2: Have your vehicles inspected. Once you receive notification that your privately-owned vehicle arrived and is ready for pickup, the first step is to pass a safety inspection. Bring shipping documents, orders, stateside registration or vehicle title, your ID card and USAREUR license, proof of car insurance and $35 (credit card, check and money order accepted) to Vehicle Registration. Attach the provided temporary tags to your vehicle. Step 3: Register your vehicle. The next step is to officially register your vehicle with U.S. Army Europe. After your vehicle passes inspection, head over to Vehicle Registration to receive permanent tags. Don’t want to wait in another line? The Vehicle Registration office has appointments available in the morning from 8-10:50 a.m. You must register your vehicle within 30 days of inspection. Bring the vehicle inspection sheet, your ID card and USAREUR license, temporary registration and tags and the application for registry (AE 190-1A). Step 4: Pick up a fuel rations card. Fuel prices at on-post gas stations in Europe are subsidized to closely match American prices. Without a fuel ration card, drivers who pump fuel at on-post gas stations will be forced to pay the local German price for gas — often much higher than prices offered on post. To get a fuel ration card for your vehicle, go to the Army and Airforce Exchange Service primary retail store. Be sure to add your spouse and any other anticipated drivers to the card during registration. You will need a fuel ration card for each vehicle you own. Another tip: Load money to the card, and you can use it at off-post Esso stations across Germany. Subscribe to the community newsletter for events, up-to-date job listings and news. The garrison prepares a weekly online newsletter that combines community news, events, job listings and flyers all in one bundled message that goes out every Thursday afternoon. Subscribe at bavariannews.com/subscribe. Register to receive emergency messages and alerts. The AtHoc mass-warning notification system sends registered users emergency warnings and other critical information, such as hazardous road conditions, reporting delays, and base closures due to severe weather. Service members, DoD civilians and contractors, and family members are all eligible to register. Learn more at Bavaria.Army.mil/AtHoc. Stay tuned on Facebook and AFN Radio. Stay abreast of community news and events by following USAG Bavaria Facebook and tuning into American Forces Network Bavaria radio channels.